Hubby and I have a favorite restaurant that serves a to-die-for clam dip with freshly made potato chips. 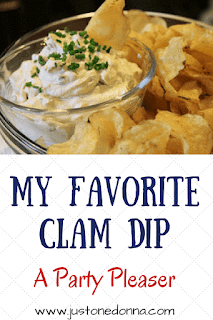 Every once in a while we find ourselves craving that clam dip. It is easy to make the dip at home with a few ingredients, you may even have on hand now. That makes this dip easy to whip together for watching the big game this weekend. 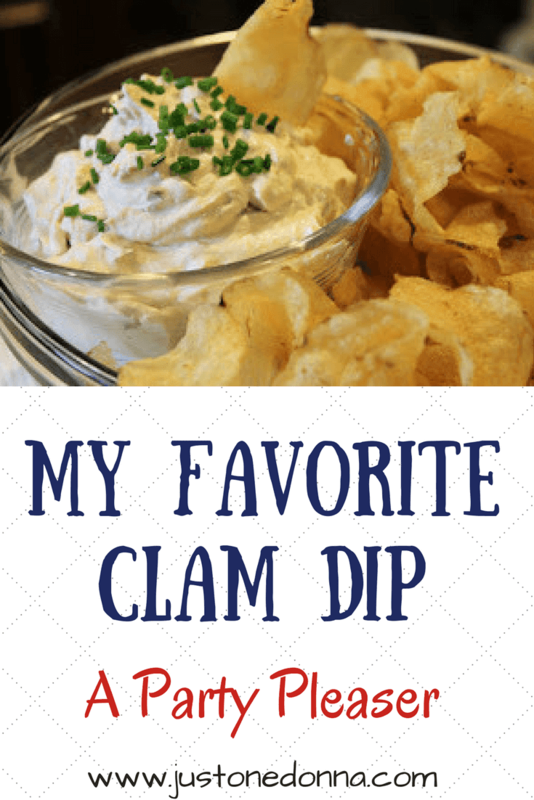 Make the clam dip a day or two ahead of serving for optimal flavor, but if you are like me you'll make it and eat it the same day. While we love freshly made potato chips, we don't usually make our own. A favorite brand of kettle chips is perfect for us. The recipe is perfect as is when served with crackers, vegetables, or thick cut potato chips. You might want to thin the dip a bit with the reserved clam juice if you are serving it with thinner store-bought potato chips. The dip will thicken when refrigerated, so keep that in mind as you decide on the consistency you want it to have. Start with room temperature cream cheese to make it easy to blend the ingredients. If you are making this last minute, you can microwave your cream cheese for one minute at 50% power (1000 watt microwave oven). Drain the clams. Place the clams in a small bowl and add the lemon juice. Set aside. Place the cream cheese and sour cream in a bowl and add the Worcestershire sauce, garlic powder, minced onion and Tabasco sauce. Stir well to combine the ingredients. Taste and adjust seasonings as needed. Add the clams and lemon juice, stirring to combine. Add some of the reserved clam juice, one tablespoon at a time, if you want your dip to be a thinner consistency. Cover and refrigerate for at least one hour for best flavor. Serve with your favorite dip accompaniments. 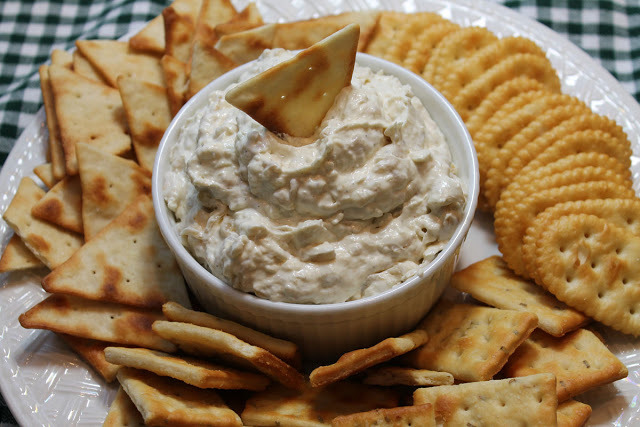 Here are two of my other favorite dip recipes. These are crowd pleasers! You can get inspiration for many other appetizers from my Appetizers Pinterest Board. Hi Donna, for the clam dip, what are you reserving the clam juice for? I don't see it in the recipe. Thanks! Hi, Annette. Use the reserved clam juice to thin the dip if you want it to be a thinner consistency. Without the clam juice this recipe results in a yummy clam spread. Add the clam juice one tablespoon at a time to thin it out, especially if you are using it with chips that might not stand up to the thicker consistency. Hope that helps! Made this for Mothers Day and the whole family loved it! It had great flavor and the Tabasco added just the right amount of kick. Didnt change a thing in the recipe but used Old Bay seasoning instead of salt, delicious. So good! So simple to make. I made it without Tabasco.Tasted great!